This little Jizoo is quite special with his glasses. I saw him at Oshima Island in the Seto Inland Sea at an amazing Stone Gallery, Sekiraku. This Jizoo has a smile like the little son of my best Japanese friend. Amazing! Fuyu no botchi. Booshi ni koke no Jizoosama! More cherry pictures of 2005, Tanjo-Ji temple in Okayama. 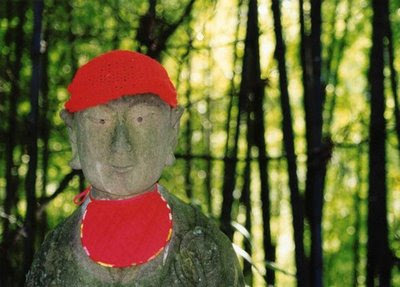 There is a Japanese Buddhist variant of the Hyakudo Mairi Shinto tradition that involves the beloved Jizo Bosatsu. It is called the 地蔵車. This translates as the Jizo Wheel (which includes the afterlife wheel, goshooguruma 後生車, ごしょうぐるま) and the Bosatsu wheel (bodaiguruma 菩提車, ぼだいぐるま). Found in front of many temples. When you say your wish while turning the wheel downward, a wish for the afterlife will be granted. When you turn the wheel upward, a wish for your present life will be granted. 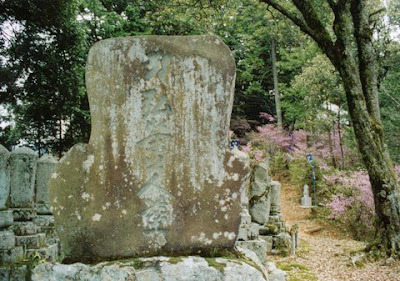 Jizoo figures heavily in the Haiku of Issa. David Lanoue has a profound essay on this subject. This river is called Sai no Kawara 賽の河原　(translated it means Sai [Childrens Limbo; Limbo means a region on the border of hell or heaven, serving as the abode after death of unbaptized infants.] Kawara [riverside]. However, while doing so, a naughty, horrible devil usually appears who disturbs their playing, breaks their towers up, and scares them. And, it is here where the long sleeves of Jizos robe comes in handy. who stacked the pebbles in front of the Jizo, because it is believed, that for every tower of pebbles you build on earth, you help the souls of the dead children to perform their duty there on the Sai no Kawara. Read my extensive articles about Sai no Kawara.
. Sai no Kawara and Mount Osorezan . Mark Schumacher has all the details !
. Daruma Megane ダルマメガネ Daruma glasses . Your Japan always brings me joy and peace, Gabi, as do your haiku. Gabi san, this is so beautiful -- both the haiku and the smiling "child" :-) Thank you for the pleasure to see Japan with you! Loved this Gabi! Here's one for you too...Although I don't know much about the God's of Japan, I enjoyed reading about this one for children. 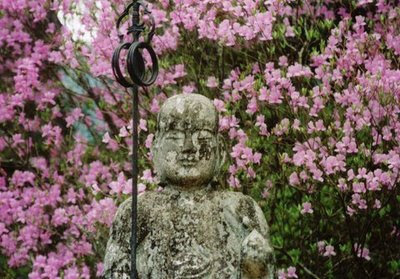 I do know about Garden Buddha's in my neighborhood. Thank you so much for this lovely one! I have never seen such a Jizou san. delightful senryu, gabi san! delightful! The moral of this story is... memorize the spoken sutra, no need for glasses! Thanks a lot, Chibi san. This particular Jizoo is from a stone mazon on a small island in the Seto Inland Sea. It is for sale ! Thank you very much, Larry, for this haiku and memories of Superman. I have often thought about this connection too! Look at him by clicking on the haiku. 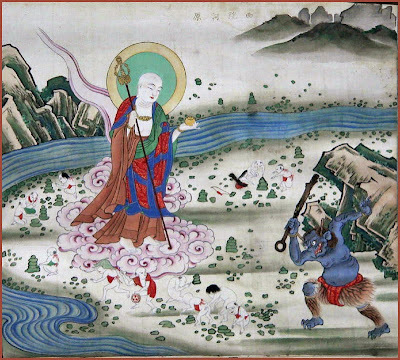 This study is the first in the English language to explore the ways medieval Japanese sought to overcome their sense of powerlessness over death. By attending to both religious practice and ritual objects used in funerals in the fourteenth and fifteenth centuries, it seeks to provide a new understanding of the relationship between the two. Karen Gerhart looks at how these special objects and rituals functioned by analyzing case studies culled from written records, diaries, and illustrated handscrolls, and by examining surviving funerary structures and painted and sculpted images. The work is divided into two parts, beginning with compelling depictions of funerary and memorial rites of several members of the aristocracy and military elite. The second part addresses the material culture of death and analyzes objects meant to sequester the dead from the living: screens, shrouds, coffins, carriages, wooden fences. This is followed by an examination of implements (banners, canopies, censers, musical instruments, offering vessels) used in memorial rituals. The final chapter discusses the various types of and uses for portraits of the deceased, focusing on the manner of their display, the patrons who commissioned them, and the types of rituals performed in front of them. Gerhart delineates the distinction between objects created for a single funeral—and meant for use in close proximity to the body, such as coffins—and those, such as banners, intended for use in multiple funerals and other Buddhist services. Richly detailed and generously illustrated, Gerhart introduces a new perspective on objects typically either overlooked by scholars or valued primarily for their artistic qualities. By placing them in the context of ritual, visual, and material culture, she reveals how rituals and ritual objects together helped to comfort the living and improve the deceased’s situation in the afterlife as well as to guide and cement societal norms of class and gender. Not only does her book make a significant contribution in the impressive amount of new information that it introduces, it also makes an important theoretical contribution as well in its interweaving of the interests and approaches of the art historian and the historian of religion. By directly engaging and challenging methodologies relevant to ritual studies, material culture, and art history, it changes once and for all our way of thinking about the visual and religious culture of premodern Japan. Thanks for sharing. I really admire this. Very nice write up. 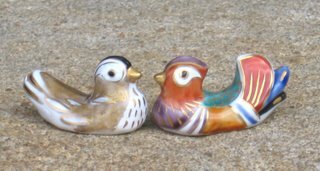 , votive tablets through which the souls of those who died unmarried were wed to painted spirit spouses. In the mountain behind 地蔵堂 the Jizo Hall there was another small hall with a few small stone statues. People called this 賽の河原 Sai no Kawara, the Children's Limbo, waiting to go to the other world after death. Before the Jizo Hall was built, a fox or a Tanuki roamed there and swindled people who wanted to pass. If this happened, such a person would soon die. To appease their soul and hold 供養 memorial services for them, the Jizo Hall was erected.